They go by a couple of different names, including Champions and Aristocrats. And there aren't too many companies that can claim to be in this elite -- though surprisingly diversified -- group. The key to getting there? A dividend that has been increased annually for at least 25 consecutive years -- an impressive feat to be sure. United Technologies Corporation (NYSE:UTX) and NextEra Energy, Inc. (NYSE:NEE) are on the cusp of hitting this major milestone and joining the list of Dividend Aristocrats. But does that make them worth buying today? United Technologies is an industrial conglomerate with a long and storied history. Its key end markets today are commercial aerospace and defense (Pratt & Whitney and UTC Aerospace Systems, about 50% of sales), and commercial and industrial (Otis Elevators and UTC Climate Controls and Security, also about 50% of sales). It takes an active role with its portfolio, adding and subtracting assets over time. For example, in 2015 the company sold helicopter maker Sikorsky Aircraft and is in the process of acquiring Rockwell Collins (NYSE:COL), which has a focus on airplanes. United Technologies has increased its dividend for 24 years, with a 9% annualized growth rate over the past decade. Although portfolio moves have left revenue largely unchanged over the past 10 years, with a lot of volatility in between, the company has improved its operating margin from 13% in 2008 to 14.5% in 2017. Earnings have also been a volatile affair, but went from $4.90 a share to $5.70 over the span. The dividend payout ratio, meanwhile, is currently around 45%, a reasonable number even though it's notably higher than 2008's roughly 28% figure. That change helps explain why more recent dividend increases have been in the low single digits, hovering around the historical rate of inflation growth. There's a bit of uncertainty in the air today, however, as the company has been hinting that a corporate breakup might be in the cards after the Rockwell Collins deal is done. This reflects the discount at which United Technologies trades relative to peers, with an enterprise value-to-EBITDA ratio that is below that of key competitors in each of its core business segments. To put it simply, investors appear to be valuing the sum less than they might the individual parts. 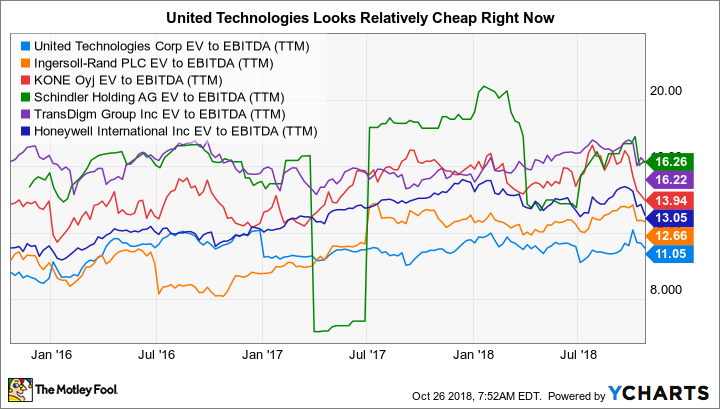 Even if United Technologies doesn't break up, however, the discounted price relative to peers is worth a close look. Rockwell Collins will materially expand its aerospace and military business, an area that has been performing quite well lately. And the company seems to be performing strongly overall, posting 8% organic sales growth in the third quarter, helped along by each of its business segments. Adjusted earnings were higher by 12% and the company increased its adjusted earnings guidance for the full year as well. In the end, United Technologies is highly likely to get to 25 years of dividend hikes as it exists today. In fact, it already announced a 5% dividend increase for the fourth quarter that will lead it to hit that goal, assuming there's no cut between now and the end of next year. And a breakup, if one takes place, won't happen overnight, so there's probably a year or more before a split might actually occur. Meanwhile, the stock looks relatively cheap today even as United Technologies continues to fine tune its portfolio to support long-term growth. The stock, which yields around 2.3%, should be of interest to investors with a value bent. Special situations investors might also want to keep it on their watchlist, too, in case a split-up is really in the cards. NextEra Energy is a giant U.S. utility, with two main business segments. The first is traditional regulated utility Florida Power & Light. This is the largest electricity provider in the state of Florida, which is benefiting from population growth and, thus, growing demand for electricity. The second segment is NextEra Energy Resources, which owns one of the world's largest portfolio of renewable power assets. Unlike United Technologies, it's pretty much steady as she goes for NextEra. On the regulated side of the business, where the company has to get rate hikes approved by government watchdogs, it plans to spend as much as $19 billion between 2017 and 2020 on infrastructure improvements and new generation. These are the types of investments regulators like to see. On the contract-focused renewable power side of the business, NextEra intends to spend as much as $25 billion adding new solar and wind capacity. Together, the company expects these investments to push earnings higher by 6% to 8% a year through 2021. With a clear path toward execution, there's a high probability of success on both fronts. What really separates NextEra from other utilities (and other companies in general) is that it is projecting dividend growth of 12% to 14% a year through 2021. That's sizable on an absolute level, but also at the very high end in the utility space. It can achieve this because it has a low payout ratio (around 45% in 2017) that it will allow to increase. Investors, meanwhile, should not only expect to see NextEra reach the 25-year mark on dividends, but also sizable dividend hikes in the years beyond that mark. UTX Dividend Per Share (Quarterly) data by YCharts. The problem is that investors clearly see the success taking shape. For example, NextEra's 2.5% yield is toward the low end of the utility peer group. It's not a good choice for income investors. However, if you are a dividend growth investor, it is worth a close look. 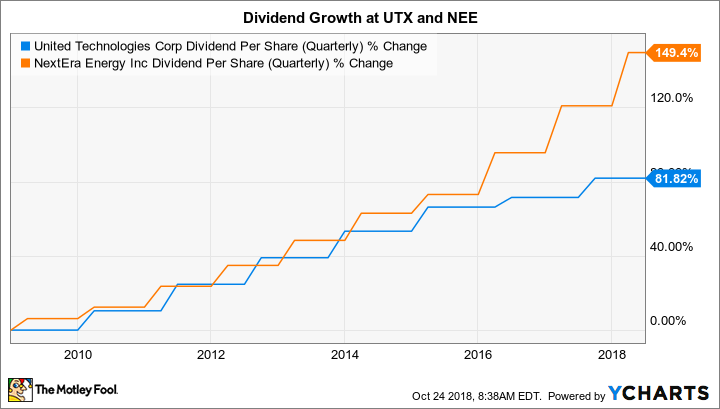 Both United Technologies and NextEra look like they will successfully enter the ranks of Dividend Aristocrats by upping their dividends for 25 consecutive years. United Technologies appears relatively cheap compared to peers, which might interest value-focused investors. The Rockwell Collins acquisition could help to unlock value here, as could the rumor of a breakup. NextEra Energy is a bit more boring, with well-defined plans to invest in its regulated assets and on the renewable power side. With a goal of 12% to 14% annual dividend growth through 2021, it's a worthwhile look for dividend growth types.